Experience the beauty of colonial style furniture with a set of Amish Econo Windsor Dining Chairs. Windsor style furniture never loses its appeal. 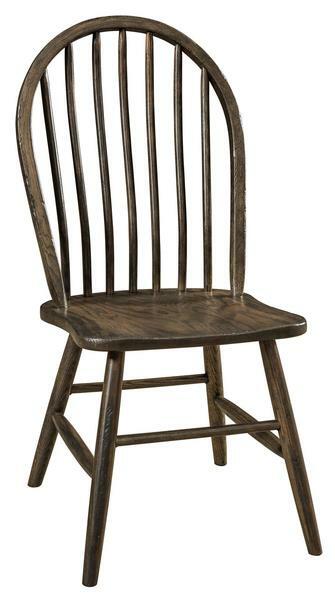 Originally built for comfort, these wood chairs feature perfectly scooped seats, steam bent bows and lovely spindles. A great accent to a country style kitchen or dining room, these Windsor chairs will last for always. The Amish Econo Windsor Dining Chair is shown here in red oak wood with distressed weathered grey wood stain. Bring home the look of Windsor chairs today and enjoy them for always. Order online, email or call us today! Back Height From Seat: 22.5"
Shown in Red Oak with Distressed Weathered Grey Wood stain.